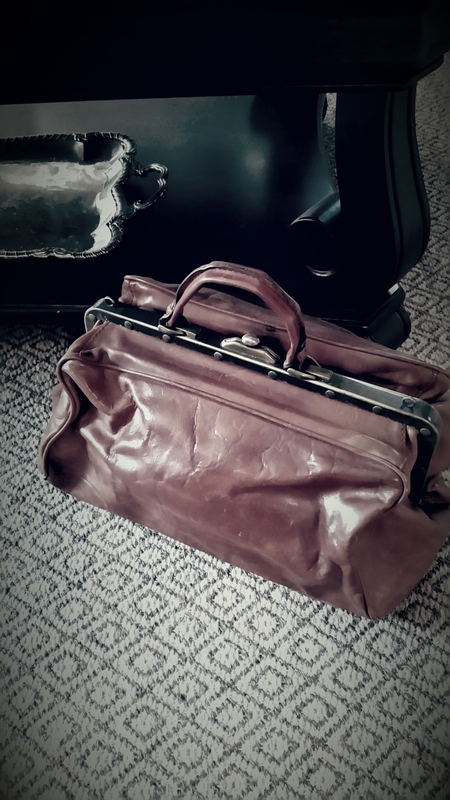 Antique Doctor’s bag from my own collection. I’d sure love to hear it tell a few stories! 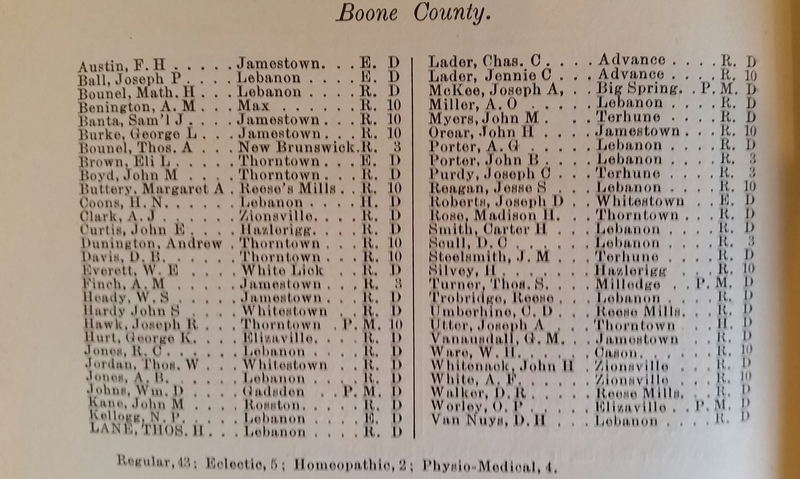 I ran across a listing of all the registered doctors the county had, according to the State Health Department, here in 1885 Boone County. I was pretty impressed! With a county population of about 32,000 people, it seemed we were covered pretty well by 1885 standards. We boasted a listing of (licensed) physicians numbering over four dozen doctors, of whom, 43 were categorized as “Regular,” five of them “Eclectic,” two as “Homeopathic,” and an additional 4 were listed as “Physio-Medical.” Two on the list were even rather obviously female (Margaret and Jennie)! An amazing part of this trivia is the number of Doctors listing their primary offices in towns that either no longer exist or today are little more than a roadside marker! Growing up, we were much closer to Brownsburg than Lebanon. So our family doctor–A.N. Scudder– actually had the office he practiced out of in Hendricks County. But the hospital he had “privileges” at was Witham. Lebanon was much closer to most of Dr Scudder’s patients than the big hospital at Danville. Doctoring with Doc Scudder was a real glimpse into the past. He did absolutely everything “the Old Fashioned Way.” And for good reason! I was born in ’60–my mother in ’35 and he delivered us both! He “caught” me at Witham and my mother at her Grandmother’s home–nearer to town. Around Witham he had a long-held reputation as the doctor who gave all the babies (well over 3000 during the years he practiced) the prettiest bellybuttons of all the docs who did baby delivering around town. Both I, and my bellybutton are thankful for that! With Dr Scudder, appointments were not made. There was no receptionist–only a waiting room. Sure, he had a phone in the office, but you only called ahead to let him know you were coming if you were bringing a kid with real swollen glands (possible mumps), lots of spots (some sort of measles or pocks) or had a real emergency-type injury. If any of these were the case, he instructed you to wait in your car by the curb, as he watched for your arrival between patients. Once safe, he would give the “all clear” by waving you in from the side door. That was contagion control back in the day. Of course if bones were sticking out of your skin, he would send you to the hospital and usually try to meet you there. Wednesdays were off limits for most patients–except in the direst of cases (the call-ahead and get waved in from the side-door type of stuff). Otherwise, Wednesdays were reserved for “Mommies to Be” and mothers with new infants. Therefore, most of my sore throat incidents just had to wait if they happened midweek. 1.You walked into the waiting room–which was in a rather modish-looking 1950’s ranch house’s front-room. It was filled with streamlined, easy-to-clean, vinyl upholstered furniture with little padding and no real apparent decor/color scheme. I remember mostly mid-toned turquoise on low slung club chairs, an odd deep salmon color for the stiff double seaters, and a few scattered high seated chairs that may have lived previously around someone’s kitchen table–done up in a glossy plastic with a faux marble printed in shades of pebble gray. ~It was not posh, but the Life, Look, and National Geographic magazines were plentiful. 2.You took notice of who was sitting there already–that’s how you knew when your turn would come. 4.Once in, you sat on an old wooden straight-backed chair with assorted leather straps at the ready and a huge mirrored exam light attached to it via a hinged arm. There was a “laying down” table for bellyache and lady problem exams too, but I generally sat in the chair with the big light while he examined my constantly festering tonsils. 5.Next he would name the problem and then go to his in-house pharmacy and dispense an envelope full of medication to cure you. We got a lot of navy blue “Flu pills” in those little white medicine envelopes. My throat usually called for a walk down the hall to the “shot room.” That’s what I called it, but I think it was really an old-school version of an outpatient surgical suite. He kept the small bottles of penicillin in a glass case under an old vision chart. There was a different, table-looking place for “lay-down” exams in there along with another one of those wooden chairs with the straps and the big light. He also had cabinets full of assorted medical equipment…large all metal syringes, speculums of assorted size for assorted orifice insertions, forceps–and lots of other things that I couldn’t even guess the purpose of. In looking back, I am not sure whether these were the good-old-days versions of sterilizing cabinets, or whether Doc just collected and displayed antique medical devices. Perhaps a little of each was true. After I had achieved a new record for “Most School Days Missed in Kindergarten and/or 1st Grade Ever” Doc gave up on saving my tonsils and I was sent to a big hospital in Indianapolis for surgery. Once I could go back to regular food instead of the Mashed Potatoes and Popsicle diet, I was pronounced “cured.” I was really bummed about going to school full time. Dr Scudder was from a different time. He knew his patients, their families, and their neighbors and generations of kin. He left us all to find newfangled Docs with fancy offices and copy machines and appointments. He quit practicing when he was just shy of 80. He then enjoyed about 10 years of retirement before going to his final reward with his dear wife. This week, I believe I watched the passing of the absolute last of his kind. My dear friend’s father passed away at 90. Dr Fuad Mukhtar had been a fixture in Boone County in private practice, at the hospital, in the community, socially, and most famously for his “walk abouts” or daily “constitutionals” he so enjoyed near his home. Doc Mukhtar was uncommon in a lot of ways. For one, he was a surgeon who didn’t golf. He was too busy being genuinely available to his family and patients and friends. Ironically, he rather hated golf–but lived front-row on the Ulen course! The last of the Good-old-days Docs had arrived~I have the photo to prove it !